It might seem like a strange headline at first. After all, what in the world could a premature baby do with an octopus and vice versa? It seems like a lot, actually. This story first came across my Facebook news feed courtesy of Daryl Lindsey of Hello Giggles. In her original article, HERE she detailed how hospital in the United Kingdom were calling for stuffed animal octopi to comfort premature babies. It seems that the cushy tentacles are reminiscent of umbilical cords and offer some comfort to the young ones. 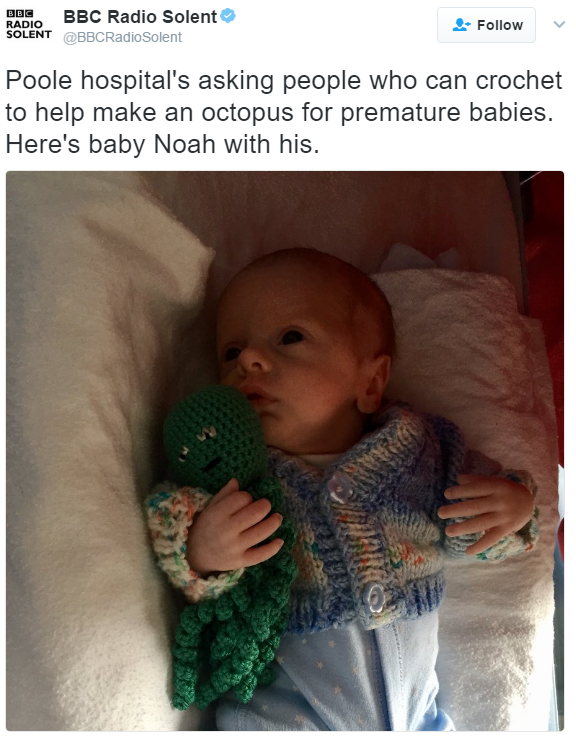 The concept of sharing octopi with premature babies is being pioneered in the NICU of Poole Hospital in Dorset, England. They are finding that when the babies cuddle up with the eight-legged buddies they are experiencing better breathing, oxygen levels, and regular sustained heartbeats. In short, the tentacles are actually relaxing and grounding the babies! It is really quite amazing to see them in action. 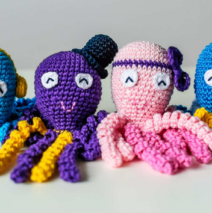 In order to be considered for donation, the tentacles must be no longer than 8.6 inches long and made with 100% cotton. Wonderful! Thank you so much for commenting and sharing; I’ve updated the post with a photography credit and direct link back to your website. Thank you! It’s beautiful work!